Lighting in communal areas is a compromise of differences in individual preferences. Confidential Client, Kansas City. Photography © Michael Robinson. With the Smart Home revolution in full bloom, users can now control their home lighting on multiple levels for convenience, economy, sustainability, and personal satisfaction. The market is inundated with solutions that provide programmable and efficient home lighting. Oddly, the passion for smart lighting has yet to hit the workplace on a grand scale, although some workplaces, a relative few overall, do rely on AI for lighting at the individual and communal level, and they set the bar extraordinarily high. But when will a popular demand for smart lighting gain momentum and affect the workplace in general, and what innovations might accompany that revolution? We think the tipping point is almost here. As individuals become accustomed to personalized lighting at home, we expect the demand for personal, individual-level lighting solutions at work to soon become a clamor. With the focus on the human experience at work for wellness and productivity, customized lighting is inevitable. Choice-based seating will push the agenda on the assumption that your lighting preferences should accompany you throughout the workplace. Simple solutions are already in place. For example, a lighting system’s response to weekend work at a facility normally closed can provide illuminated walking paths for safety as well as lighting at work and amenity areas that follows you throughout the facility. Another example, which has been around for a while at a basic level, is task lighting that adjusts to individual preferences and can deliver color temperature control and dimming as needed. Taking your lighting preferences with you is increasingly important in a choice-based work environment. Confidential Client, San Diego, California. Photography © Benny Chan. 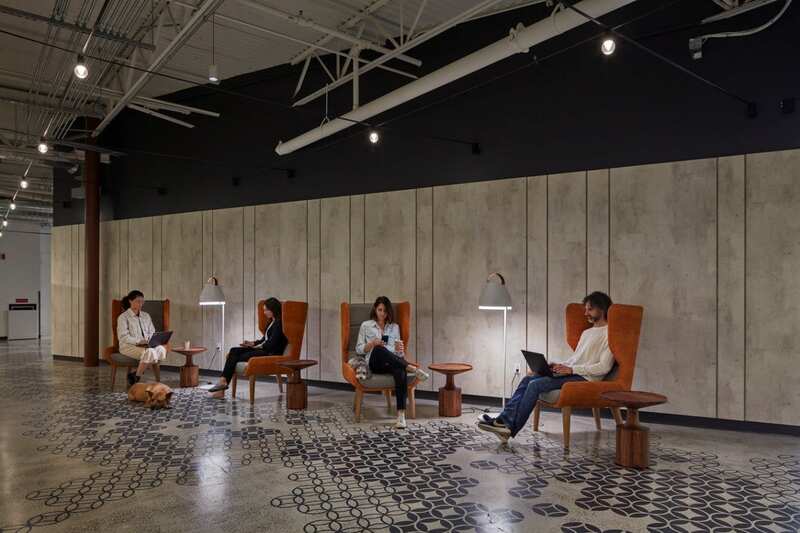 If today’s workplace is as flexible as touted, and it is, then the ability to move and adapt lighting solutions to match how staff moves and works is critical. Interestingly, the technology is here, waiting to be implemented, but its expense will not out-weigh budget until a critical mass for demand hits the forefront. Ultimately, the drive to include smart lighting features in the workplace depends on decision makers who, in an effort to align the workplace with the expectations of the best and the brightest and to attract and retain critical intellectual capital, will inevitably respond to worker demand. And, predictably, a surge in implementation will bring prices down. Color tunable lighting will likely be an early trend. Frequently discussed early in design planning, but included in the furniture budget as color tunable task lighting, it is often one of the first options to go during value engineering. Overall, the technology currently in existence exceeds expectations. The current use of Alexa, Siri, and other home AI features relies heavily on voice control. We’d expect the same to transfer to commercial environments. Enter the workspace using a card, fob, fingerprint, etc., and you’re instantly recognized and tracked. This does raise the question of personal privacy, but that concern is already compromised by the use of today’s technology, a fact accepted by most. And the benefits for the individual are obvious and a special plus for those with disabilities as lighting becomes a factor of inclusive design. AI can remove the need for excessive interaction, adjusting intuitively to each user’s needs and preferences. The hardware and software are available, often already in use serving other applications within the workspace, which could allow lighting to take advantage of its capabilities. Lighting for wellness is just becoming prevalent today, but think of the possibilities: boardrooms lit to facilitate amicable, productive meetings; conference rooms with light tuned to energetic brainstorming; lighting that responds to individual mood or creates mood. Lighting geared to the energetic level or mood of a task can facilitate collaboration. 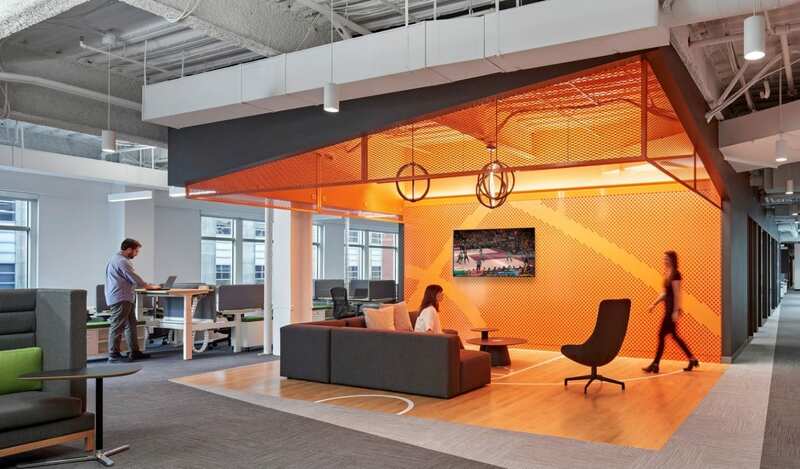 DraftKings Headquarters, Boston. Photography © Robert Benson. Fundamental to all that we do, the impact of light at optimum levels and temperatures is only minimally acknowledged for the most part in the workplace, although it is basic to good health and best performance. The opportunities to improve wellbeing and productivity through the use of smart lighting are legion and waiting in the wings. Moreover, consider the wireless transmission of power. It may happen in the not too distant future, replacing raised floors and offering a bounty of possibilities and options that will revolutionize the way we work, live, and take light with us wherever we go. If providing more control at the individual level to increase autonomy and enrich the human experience and wellbeing at work are positive ways to further employee satisfaction, production, and health, then smart lighting offers opportunities that are on the verge of impacting the workplace in profound new ways—it’s just a matter of time. Lighting geared to personal preference plays a crucial role in employee satisfaction, wellness, and productivity. Confidential Client, San Diego, California Photography © Benny Chan. Senior Director of Lighting Design Gary Bouthillette has over 20 years of experience as an architect providing design and lighting solutions for major organizations and Fortune 500 companies spanning an extensive range of industries, including technology, finance, entertainment, law, education, and energy, to name a few. He is a member of the AIA, lighting certified by the National Council on Qualifications for Lighting Professionals, and a member of the Illuminating Engineering Society of North America. Although he works nation-wide, Gary is based in IA’s Los Angeles office.